Our top-of-the-line solar panels give homeowners more energy. They deliver the highest efficiency available in a residential solar panel today, at a record-breaking 22.8%.1 That means homeowners get more electricity, more flexibility, more peace of mind, and lower electricity bills. 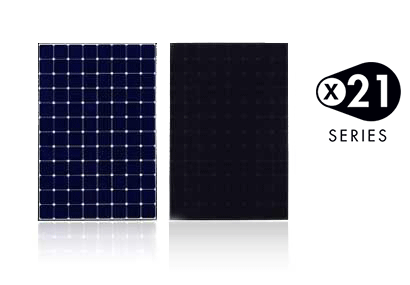 Most energy from less space: SunPower X-Series solar panels deliver 44% more power per panel.2 Which means you can create more power in smaller spaces, with fewer panels. And, you can position them on the sunniest parts of your roof. 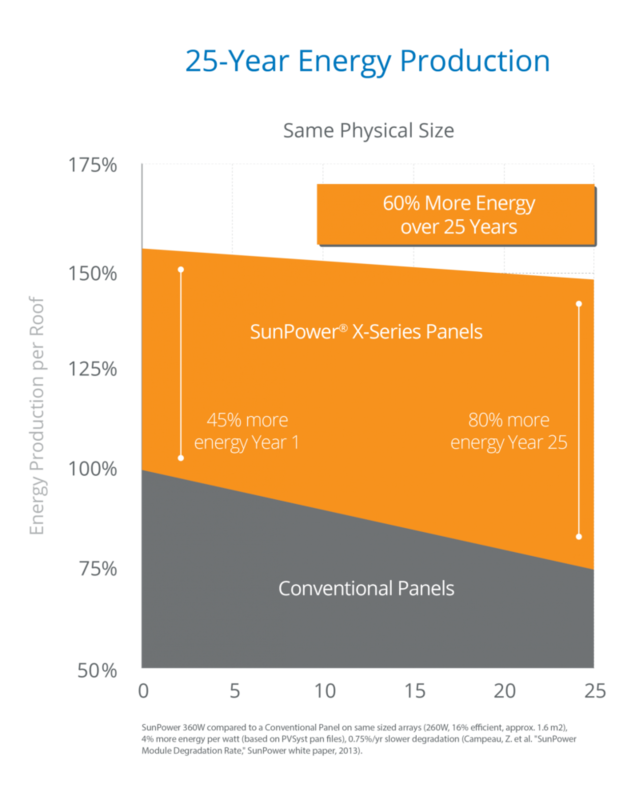 Most electricity: Simply put, SunPower X-Series panels produce more electricity than conventional panels. They convert more sunlight to electricity, producing 60% more energy per square foot over the first 25 years. Most flexibility: Because X-Series residential solar panels generate more electricity from a smaller area, you can expand energy production simply by using additional roof space to add more panels later. Most peace of mind: More guaranteed power. SunPower offers the best combined power and product warranty over 25 years.5 And because they’re built on a solid copper foundation, SunPower solar cells deliver unmatched reliability over the lifetime of your solar energy system. Most beautiful: X-Series panels are offered in SunPower® Signature™ Black, designed to blend harmoniously into your roof. Built using all-black solar cells and anti-reflective glass to reduce glare, the premium aesthetics can accommodate a variety of architectural styles. At SunPower® by New York State Solar Farm, we are proud to be a SunPower® Master Dealer. Master Dealers are selected for their superior customer service, installation quality and success in the region. Our partnership with SunPower® enables us to offer unparalleled products and services throughout the Hudson Valley and beyond. Sunpower® is known as a leader in innovation, consistently delivering the most advanced and progressive energy solutions. The fully-integrated, sustainable approach to solar energy has changed the way we think about the energy of the future. Our comprehensive customer assurance program includes long-lasting warranties, fast turnaround for customer inquiries, customer satisfaction tracking and post-installation inspection programs to ensure customers enjoy a smooth transition to solar energy. Sunpower® has over 30 years of history in solar energy solutions. This experience is time-tested and proven. The forward-thinking approach to the solar power landscape keeps our customers ahead of the curve with the latest technology. Sunpower® is the only company to earn the Cradle to Cradle® designation in the solar industry. We share Sunpower’s passion for solar education and providing affordable, clean energy to the world. We sell, install, and service SunPower’s state-of-the-art solar energy systems. With Sunpower® products and dedication to outstanding customer care, you can see, feel, and enjoy the difference you are making in our community and our environment. You can always call us or email info@nyssf.com if you have a question or concern. Get a Free Solar Design Today! Does Solar Work in the Snow? Have you noticed a lot more people “Going Solar”? Do you know why? Three Tips for Removing Trees to go Solar! Does Leasing Solar panels make sense in New York State? Get a $25 Gift Card - Bring in Your Utility Bill & Learn About Going Solar! We are a Master Dealer of SunPower® solar products and leaders in designing and integrating solar electric systems in the New York Hudson Valley communities. Earn $500 for Every Referral that Goes Solar with Us!